More than a few decades ago, while feeding livestock during an infamous Eastern Montana winter, I had a team of horses that taught me a thing or two about an animal’s stress. Can’t remember when but somewhere along the way, I had purchased this black thirteen-year old draft mare that was very well broke. Although we never rode her, given that she was a very kind, gentle animal, I am pretty certain she would have doubled very nicely as a saddle horse. Around ‘bout that time, I also traded for a big, stout, gray, five-year old Percheron mare. Unlike the draft mare, though, this one had never been handled. My kids, being very good at naming critters on the ranch, christened the black mare “Sweetie Pie” and the gray “Flat Bed Annie.” Very aptly named I might add. After so many years, you might just wonder what brought these two horses back to my mind? Could it be the harsh winter we’re having here in Sisters, OR? And the memories that all this snow brings to me of Montana? Perhaps. Regardless, sitting here at my kitchen table, I can’t help but be a little pregnant with stories, remembering those two horses – and what can happen when you team an inexperienced bronc with a mature, steady one. For now, let’s go back to that winter – and stress. Now, unbroken Flat Bed Annie arrived at our ranch prior to me meeting Ray Hunt and the start of my “true” education regarding the horse. So, what I did with her was not a whole lot. In fact, I worked with her just enough to get her somewhat halter broke. I did some ground driving and managed to harness her by tying up a hind foot. 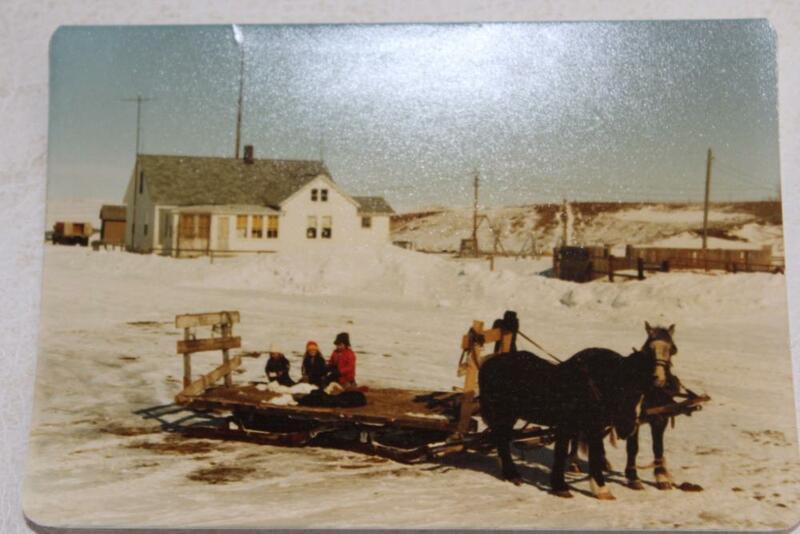 It wasn’t long before I hooked Flat Bed Annie to the sled with Sweetie Pie and put her right to work. A “real” job. Imagine that! Mind you, that winter, we had snow that was “hip pocket deep to a tall Indian,” as the saying goes. The snow started in November and did not leave until April. So you can imagine the degree of physical labor involved for these two gals pulling a sled load of hay around acres of cattle and sheep. Looking back, I see now how cowboy clueless I was to the stress this animal was under. Within the first three weeks, Flat Bed Annie lost weight and drew up in the flanks like a disemboweled jaybird. All the while, Sweetie Pie stayed in the same physical condition save for some muscle toning even though at times she was handling more than her share of the load. Then, as weeks passed, I began to notice something. Along about the middle of December, Flat Bed Annie began to fill up, even losing some of the gauntness in her flank. As the winter progressed, she put on more weight, rounding out like a good, healthy horse, and truly handled her share of the work. What was even more evident was how Flat Bed Annie had learned to settle in without so much worry and stress. Although I would like to take some credit here, not the case. You see, I did not yet know about how horses think, let alone that they could be taught to let go of a thought and take up another. Yet, the facts were plain as day. Annie’s physical condition was directly related to her thought life. And so was Sweetie Pie’s. Despite her co-worker being pretty troubled, Sweetie Pie operated out of a place of peace. She never once balked even though the work was hard and she had to put up with the fear and shenanigans of her troubled Annie. Remembering those two mares so drives home my desire to share with people about how to teach a horse to let go of a thought — particularly a troubling one — and help the horse take up another thought that would better fit the situation and bring them peace. My point in sharing this story with you is this. We, as human beings, are not unlike the horse with respect to our thoughts. Our thoughts determine whether we are operating out of stress or from a place of our peace and wholeness. Like the horse, if we want to get “settled in,” we actually have to “learn” to let go of one thought so that we might “take” up another that will be more beneficial. Bottom line, we are not so much responsible for all the thoughts that come into our heads as we are for the ones we keep. To a degree, so it is also the case our horses. They have a lot of thoughts, often stressful. As the human, it is our responsibility to help our horses learn how to keep the good ones so that they might accomplish their tasks in relative good humor and peacefulness. Yet how can we do that if our thoughts are spinning like a rollercoaster? Jesus Christ has given us the answer. “Come to Me,” He said, “all you who labor and are heavy laden, and I will give you rest.” Yes. The one true source of good thoughts originates with Jesus Christ, The King of Kings and The Prince of Peace. Whatever place you find yourself in – whether it is a bitter Eastern Montana winter or whatnot – may you find yourself going to Him who promises rest. Such a good word, and timely. Thanks! Thank you so much, Charlie, for your wonderful words and thoughts! And AMEN!!!! You’re welcome. Glad to be able to share. Great example of a divine truth! You’re welcome Donita. Snow time is good slow time.